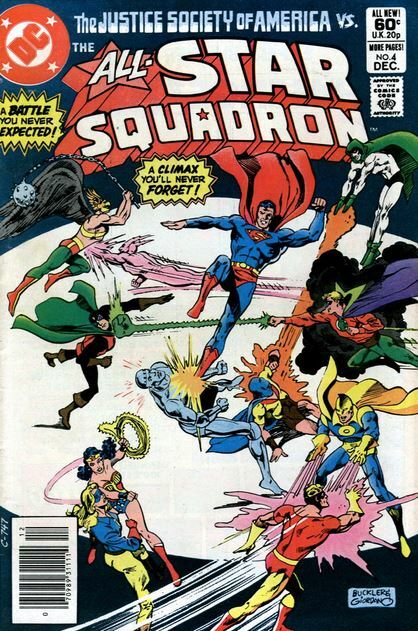 I initially referred to the All-Star Squadron as the backup of the JSA but it looks like I'm mistaken. 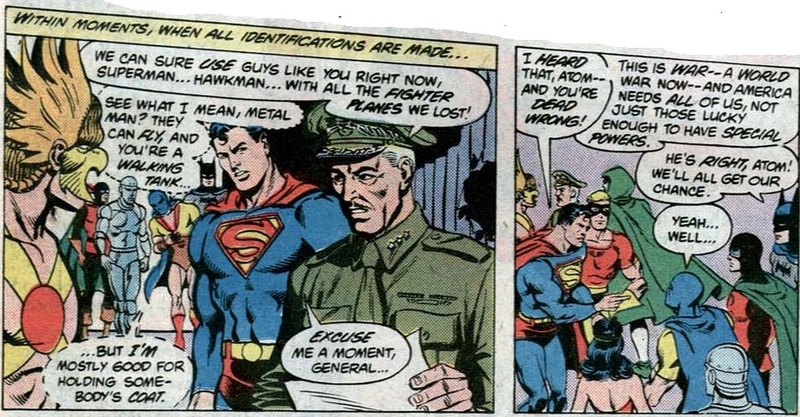 It looks like the JSA is a subset of the All-Star Squadron, a group specially formed to support the United States during World War II. Hmmm, based on the conversation below, Dr. Fate no longer wields magic. That leaves invincibility, super-strength and flight. If I remember correctly it was something about the full helmet of Nabu starting to take full possession of Kent Nelson. 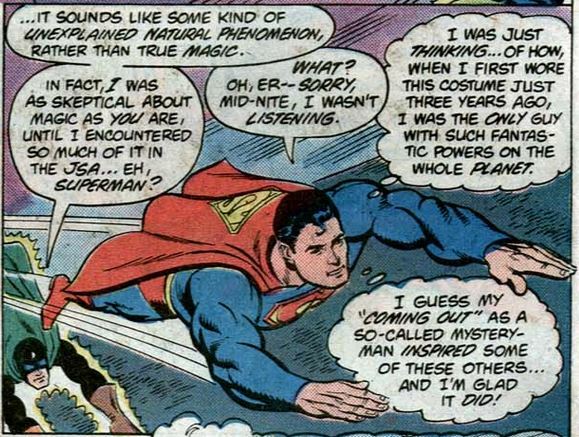 Look how new Superman is based on his thought baloon. 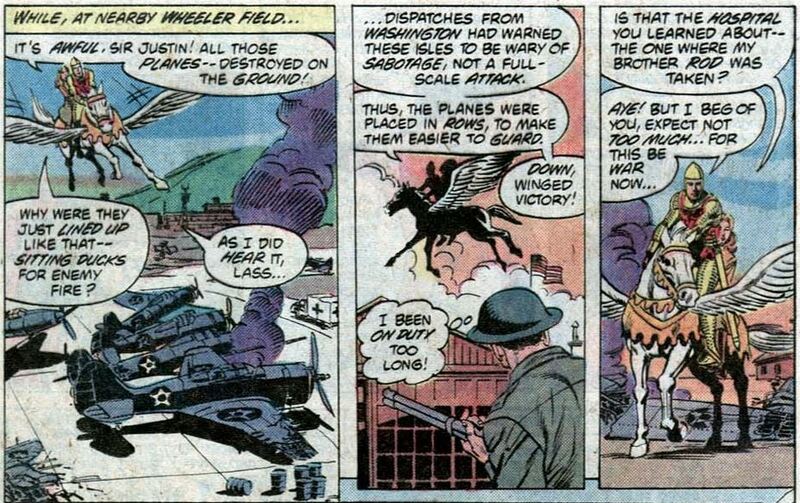 The All-Star Squadron come upon the aftermath of Pearl Harbor. The heroes arriving by air over Oahu are mistaken for enemy planes and the Americans strafe them with anti-aircraft ordinance. 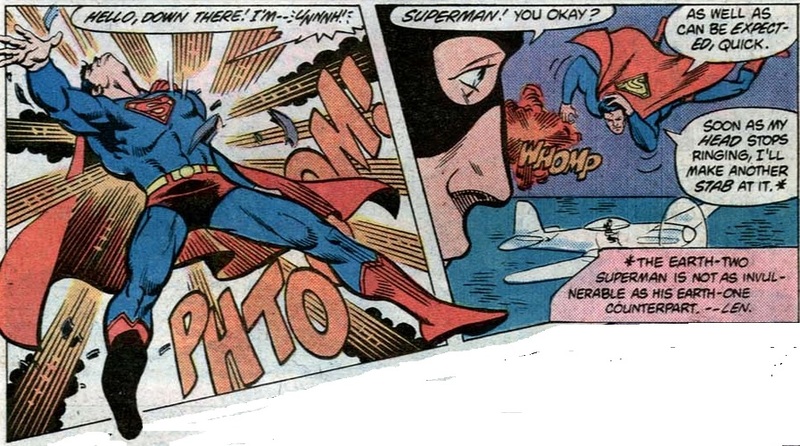 Superman intends to fly down and tell the soldiers there's nothing to worry about but . . . 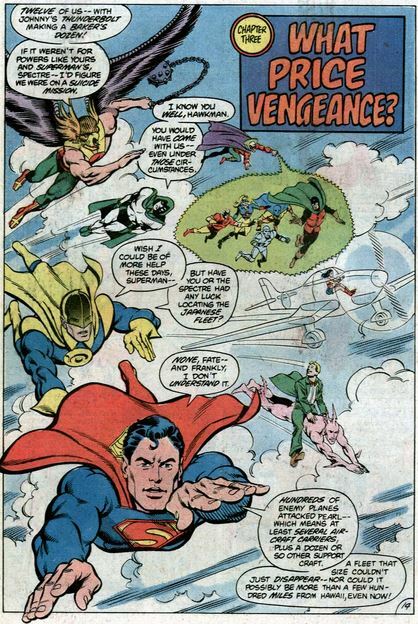 Note the box to the bottom right from editor Len Wein noting that the Earth-2 Superman isn't as invulnerable as the Earth-1 (Justice League) Superman. I find that detail very welcome since it could lead to more interesting stories. 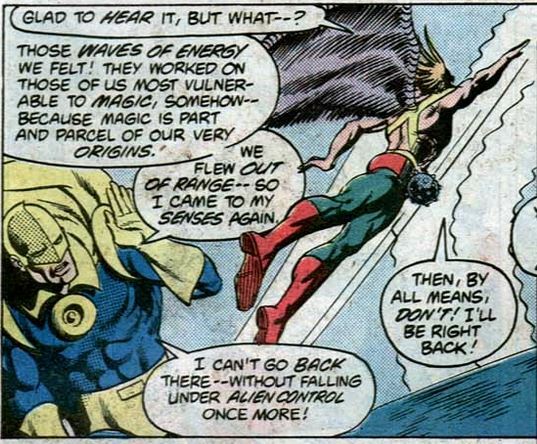 Johnny Thunder demonstrates his magic power of command. 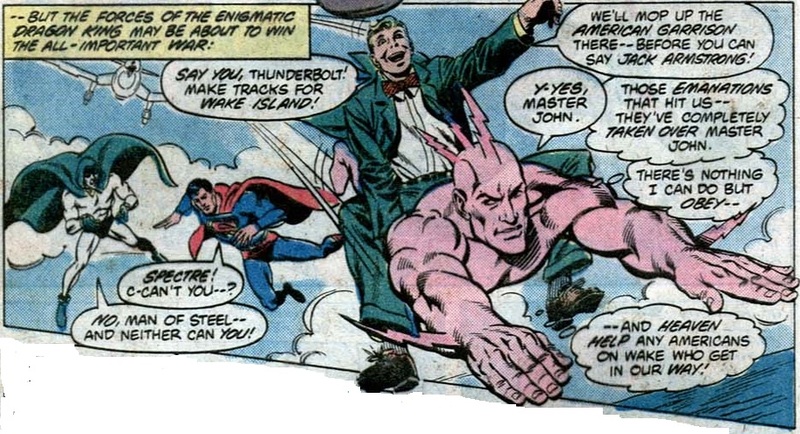 I love the concept of Johnny Thunder - This guy is Aladdin for DC comics. 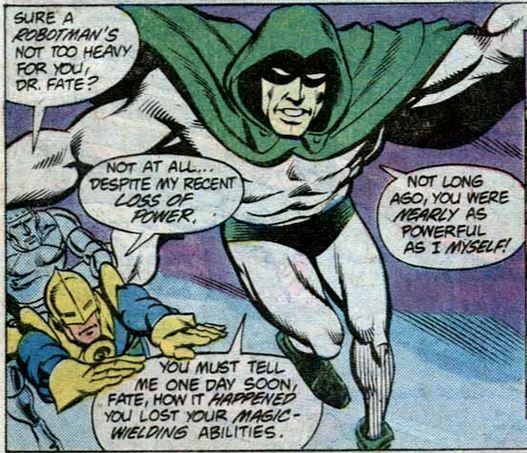 The Atom is feeling understandably intimidated by all the super-types. Don't worry Al Pratt you're atomic powers are in the mail. Superman has brought up a point that has to be dealt with. As of this moment this is the plan. The plan is both obvious and sensible. Looks like we have a little detail of why the planes were so close together during Pearl Harbor. Danette Reilly finds out that her brother, the original Firebrand, is comatose. Here is the group looking for the Japanese fleet that attacked Pearl Harbor. Every flier is a JSAer. 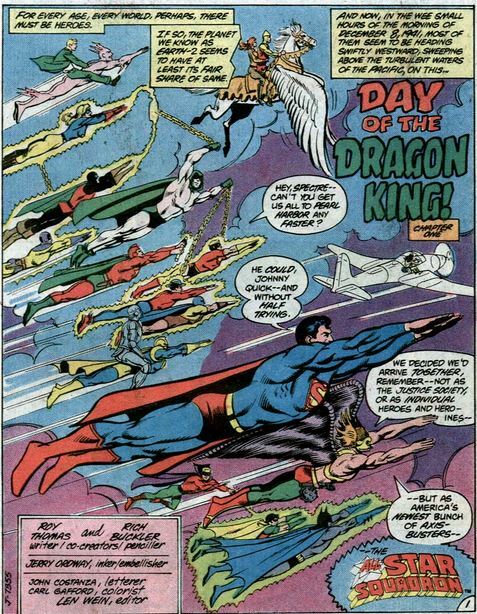 Surprisingly, Superman and the others cannot find the Japanese Fleet. They decide to head to Wake Island. In another nearby island we meet the Dragon King and he has something that he says will protect Japan from super-powered attack. This defensive 'system' is centered around two legendary artifacts: The Holy Grail and the Spear of Destiny. Both are in the possession of the Axis powers. These artifacts, in conjuction with a dynamo specially shipped from Japan, will make America's heroes fall under Japanese control. Not all the heroes are affected but unfortunately some of the most powerful ones are. For example, Dr. Fate. 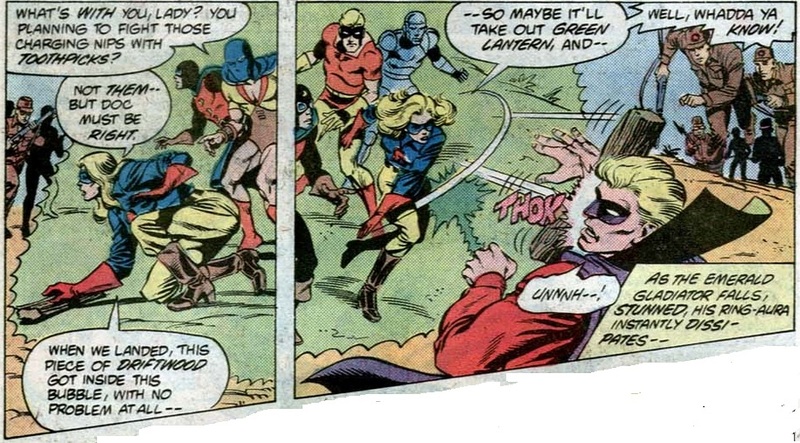 Green Lantern is another but Liberty Belle uses his weakness to wood to knock him out. Dr. Mid-Nite and Johnny Quick are unaffected. Here's a closer look at Johnny Quick. Oh no. 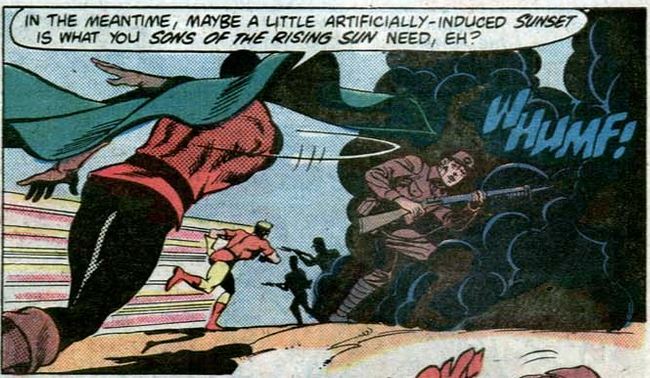 Although the Spectre and Superman can still fight the influence of the artifacts Johnny Thunder succumbs. 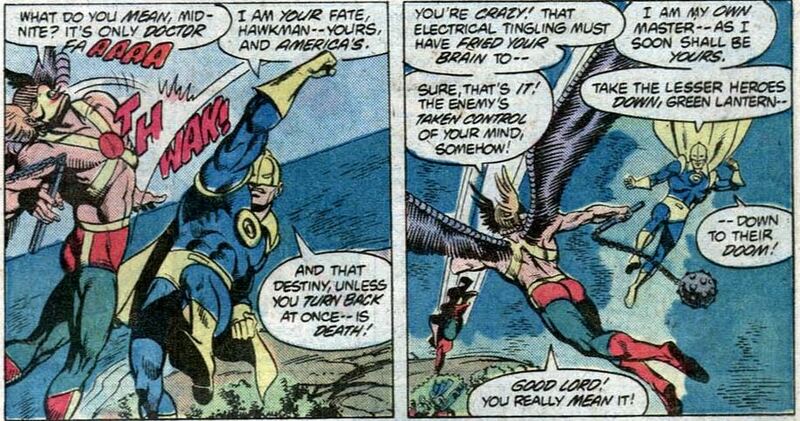 The skirmishing Hawkman and Dr. Fate find out that there is a limit to the influence of the artifacts. Dr. Fate explains why some heroes go under the influence while others don't. Robotman lives up to his reputation as a walking tank. Armed with the knowledge of an 'invisible border' to the emanations. 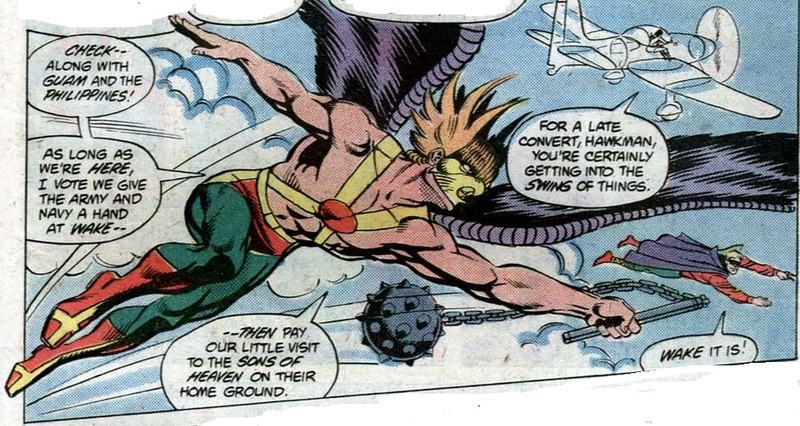 Hawkman manages to lure everybody out of the zone of influence. Another such zone exists in Europe around Germany and the Spear of Destiny. 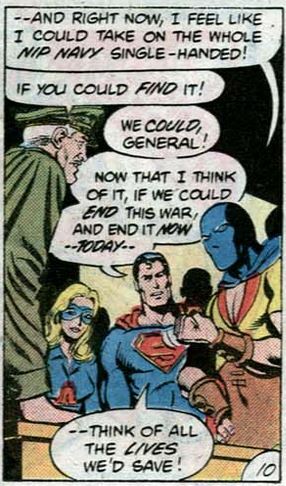 And this neatly explains why the JSA and All-Star Squadron can't simply go over to those places and win the war. The non-magical heroes can but without the heavy hitters victory is by no means assured.